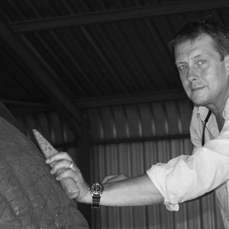 Heinrich is a South African sculptor whose keen eye for nature is accurately reproduced in his detailed works. His love for the African bush has been an enduring hallmark of his life - from his early days spent walking Southern Africa's game trails through to adulthood working as a professional safari guide. From the age of 11, Heinrich has had an abiding love of nature, nurtured by his brother-in-law, a wildlife vet who took him on game walks and introduced him to the wildlife he tended in South Africa's private game reserves. After university, he headed out into the bush, opting for life as a safari guide. Being able to scour the African bush in search of its abundant wildlife was like coming home. Heinrich would spend 12 years as a professional safari guide leading luxury mobile safaris and expeditions across South Africa and Botswana's Okavango Delta and also worked in a series of luxury safari camps. In 1995 Heinrich met his wife in Maun, Botswana, and after their wedding in 2000 the couple moved to London. In search of a new challenge and career, Heinrich met up with a friend, Simon Dyer, who had become an internationally renowned sculptor and was in need of a silversmith and finisher. Although Heinrich has never had formal art school training, teaching himself fine metalworking he soon discovered his own artistic ability and eye for detail. He specialized in the chasing and finishing of fine bronze and silver sculptures and restoring antique and modern metalwork. During his time in London Heinrich quickly built up a reputation for his excellent craftsmanship and established sculptors used him to finish and chase their bronze and silver equine and wildlife sculptures. Heinrich has worked on commissioned pieces destined for HRH Prince of Wales, Prince William, Sheikh Mohammed, Sheik Zayed and Sheik Al Maktoum, including works on display at William & Son, the Sladmore Gallery and the Halcyon Gallery. Returning 12 years later to South Africa with his young family, equipped with skills he honed over the years Heinrich took up a challenge to make his own work and took to it like a duck to water. Taking inspiration from the bush and his previous experience as a safari guide he naturally took up wildlife sculpting. Heinrich's love for silver made it possible for him to manifest his keen eye for detail and craftsmanship as each piece is individually chased and finished by the sculptor himself. The artist would like to establish silver as a medium for sculpture in South Africa as it is relatively rare and not yet widely appreciated. Commissions can be undertaken in Sterling silver and bronze and are available in any size and are all exclusively sculpted and finished by the sculptor himself. Price on application.